The Truth Behind HeLa ~Taelor A. Before reading chapter five of Rigor Mortis I can honestly say I had no idea what a cell line was. But after reading chapter five and doing some research I know that a cell line is a cell culture made from a single cell. 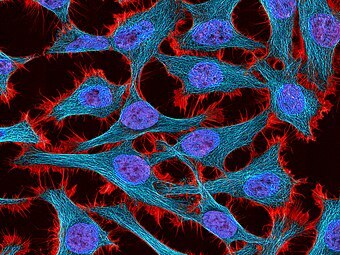 Many scientists use cell lines to help their research for cancer but on various occasions, these cell lines become corrupted by HeLa cells. (hint the name HeLa). The reason why this cell line was so special was the fact that it kept living when usually normal cells in a cell line die off. HeLa cells are the gods of cells because they had become immortal. When I first read about the cells I thought how are these cells bad if they can live forever it sounded pretty cool to me, but there’s a lot more to it. Like the fact that HeLa cells grow so much that they can easily take over different cell lines. So easily that one mistake like not disinfecting a petri dish can cause normal cells into HeLa cells. In the 1960’s and the 1970’s Walter Nelson-Rees spent many hours a day researching different cancer cell lines, and finding out that they weren’t different cell lines but HeLa cells. After finding out this Nelson started to point out the faults in many scientist research. Even though Nelson’s work was published and proven true plenty of scientist ignored him and continued their false research. Though most ignored the warning Nelson-Rees gave, some listen one even wrote a book about it. That one being writer Michael Gold he wrote a book about Nelson-Rees and his campaign against HeLa it’s called A Conspiracy of Cells. I have to completely agree with Mr. Korch because scientists are practically throwing away money for research to find out that what they think is a breakthrough it’s just HeLa. I’m amazed by the extreme effect HeLa can have on a cell line it is truly mind blowing. especially when you think that this tiny microscopical thing can corrupt the world of biomedical research.